One day you get up and go outside and its autumn, just like that, the light is different, there is a heavy dew and a slight chill in the air. There have been no warnings, no reminders on your computer but the earth has been relentlesly spinning along at 1000mph in its journey around the sun and the 23.4 degree axial tilt to the suns plane of the ecliptic has been slowly taking the northern hemisphere to a more oblique angle to its warming rays. We may be approaching perihelion ( the point at which the earth is closest to the sun during its yearly circuit) which is in January, mid winter really, but this solar proximity does not affect us in the UK due to the axial tilt, its just one of the amazing balances of life/climate on our planet. Our environment responds, cold air forms in that valleys and gives us lovely early morning inversions, the trees respond to the reducing light by stopping their photosynthesis, the cells thicken below the leaves bringing a blush of gold, then reds and ultimately flaming oranges to the canopy before the first of the winters blows send them tumbling and spinning like some multicoloured blizzard to form mulchy smelling rotting drifts piling up on the ground. Nature responds, many of our species of birds flock and follow, to them, some inexplicable urge to head south escaping the coming winter months even though it means running the gauntlet of the mediterranean lands where they are considered a target and a delicacy to brighten the evening meal. Other species fatten themselves up or lay down reserves of food to tide them over the coming harder months when food is sparse. For us autumn is a magical time, the changing seasons heighten the perceptions, the light on the land is constantly shifting, early mornings and evenings are times when you are out getting to or coming back from some high level rendezvous and as such you see the more magical happenings of ‘Dragons Breath’ or the flaming sunsets from the tops. Group from Ibstock Place School on their silver assessed reveling in the early morning sun. We even had one of the most spectacular celestial events to bring further magic to the season and another reminder of just how amazing our world/solar system is. 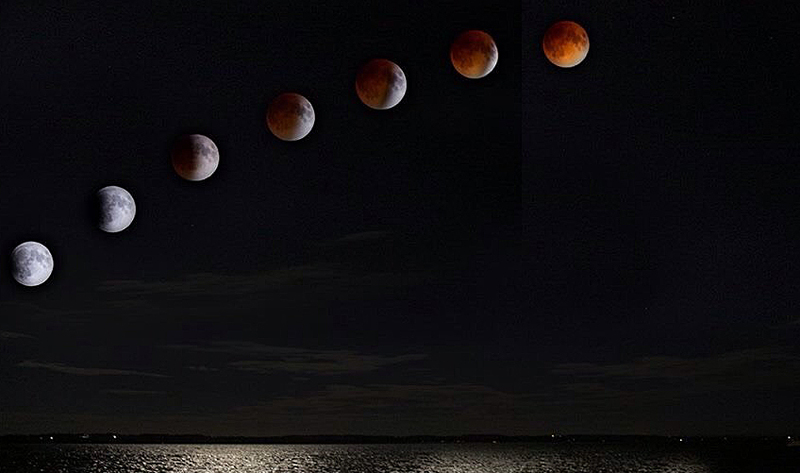 The full eclipse producing a blood red moon and amazing me again that the moon is exactly the right size and distance from the earth/sun to produce a perfect penumbral eclipse. The moon believed to have come from a collision between the earth and some other celestial body which produced the axial tilt and the seasonal changes I am discussing….WOW !! 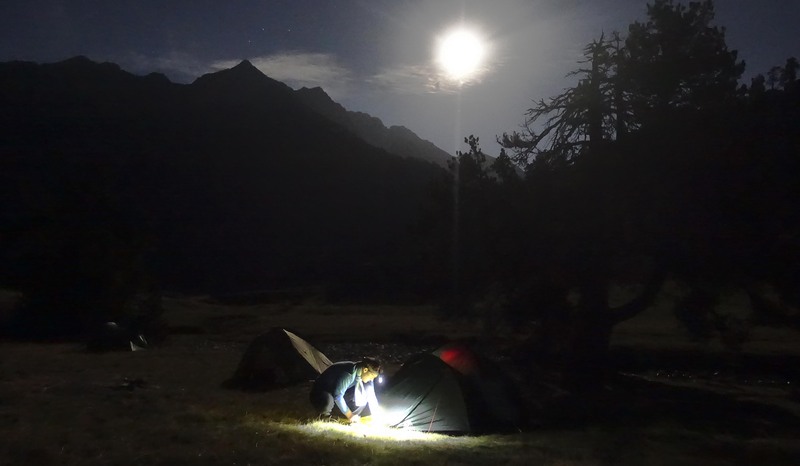 The daylight hours shorten bringing a focus to navigational competence as errors can mean a decent on steep ground in the failing light and a meal cooked in the dark and lowering temperatures. Tents are welcome retreats in the evening, warm kit, staying dry and well fed has a greater focus for participants and the responsibility that this brings rewards us when everything goes well and the groups succeed in the increasingly demanding environment. This year saw one of our busiest autumn seasons, we have not had a free weekend since our return from the Pyrenees in August, the weather was very kind with an Indian summer that just went on and on and on producing magical moments on an almost daily basis. We had only one majorly foul day when Jane and I got stuck behind a swollen river and were forced to do a six K detour in torrential rain to find a crossing spot further up the hill. Water tower on Tallybont reservoir in the early morning mist. The groups from all our schools and at all levels of the award were superb ( as most of the groups we prepare are ) up in the dark and cold, generally bang on time, properly prepared and ready to achieve even with very demanding routes. Autumn is also a time of assessing groups who took their practice on before the summer break so we spend more time distance supervising and just watching and talking to groups who have been properly trained already. Sounds idyllic ? It can be. The last expedition took place the weekend just passed, back in the Black Mountains again, Jane and I were walking along one of the high ridges in five metre visibility when a flock of Redwings appeared out of the cloud heading directly for us, they had little time to adjust to our presence and all of a sudden we were surrounded by these beautiful birds who were gone just as quickly as they had appeared leaving us to wonder if we had imagined the whole episode. A magical little encounter to end the DofE year. Evening light creates geometry out of the geology of Fan Fawr. Now its time to sort kit, pick up the pieces of a busy year and prepare for next years already full diary. It also time for a holiday, a busman’s one of course. 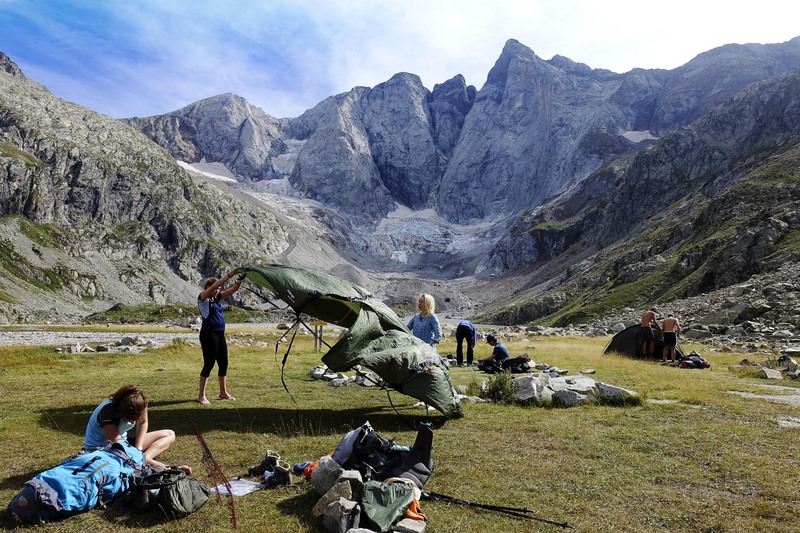 Is this the best overseas destination for DofE ? I have little doubt in my mind that the best country to hold a Gold DofE expedition in is the UK. Here we are blessed with a number of fabulous National Parks in which it is still possible to find a degree of wildness and therefore isolation, the Crow Act which grants us relatively unhindered freedom of access, a plethora of cheap farm campsites, a network of good paths and of course completely unpredictable weather that challenges accordingly. I have tried to replicate the award in many areas of the world and in general failed, sometimes quite miserably. The jungle, the greater ranges, busy National Parks or over enthusiastic in-country guides just do not work: it is almost impossible to give the groups freedom or to give multiple groups significantly different routes. It becomes a box ticking exercise, which fails to create the environment in which the participants really benefit from the exercise. There are however several European destinations, mainly in the mountains or National Parks that are almost ideal for the award and the French/Spanish Pyrenees is certainly one of them. Freedom of access, a network of generally good and sometimes very challenging paths that give the opportunity to set routes for a variety of abilities whilst keeping groups discrete, the right to wild camp in designated areas and with real ease of relatively cheap access via Easy Jet (other providers are of course available). It was with a real degree of excitement that I found myself with Jane and Pete on a redeye plane accompanied by 17 young adults and three teachers from Ibstock Place School, Toulouse bound for a seven-day trip that encompassed a Gold assessed expedition. A one hour delay in leaving did not upset our coach driver who met us at the airport, loaded us all aboard and departed under depressingly grey skies bound for Cauterets, a small alpine type village in the depths of the French (just) Pyrenees. We arrived in a different world some two hours later; as we travelled the skies had changed from grey to blue, the landscape from the wide wine bearing plains to the steep shadow filled and pine tree coated valleys of the mountains, and the air from heavy and smelling of jet fuel to mountain freshness. The comfortable and very competitively priced campsite welcomed us with open arms, the supermarket some 200m down the road provided us with victuals enough and the town center, a 20min walk away, the lure of roadside café’s and restaurants – food. Ten the next morning we were lifted from the valley floor, by the cable car network which services the skiing industry in winter, to a world of circling vultures, fiercely sunlit high tops and long distance views. Beneath our feet suicide intent mountain bikers hurtled down tracks that I could not have walked down, whilst gentle bovine beasties watched them and rung their softly sounding bells which provided a somewhat surreal backing track to the insanity going on around them. We spent all day walking at around the 2000m mark, getting used to the steep, rough and sometimes scary terrain and to the maps which although they are at a similar scale to those used by DofE groups in the UK, just look very different. We scraped onto the last bus back from Pont D’Espagne after a rather longer day than anticipated, arriving with 5 minutes to spare before it departed. The driver deposited us in Cauterets where the 23 of us went off like a scatter bomb into variously priced restaurants to rehydrate and stuff ourselves with pizza and a variety of other foodstuffs. Condensing back at the campsite under the light of head torches a few hours later, we slept the sleep of the deeply content that only a good day in the mountains can bring to the body and soul. Next day we rested, shopped, continued to hydrate and just generally prepared for the next four days ahead. The next point (opinion) about DofE supervision is that I do not think it is ideal for leaders to be walking with full rucksacks: doing so reduces your ability to react to any issues you might have, it slows you down on the ground and is just an encumbrance when managing people on steep ground. However given the remote nature of one of the routes and the wild camping spots that one of the groups were using, Jane and I had no real alternative but to hump our homes and supplies with us for the duration. Well let’s be honest here, one of the sites was remote and required us to wild camp about 1km away from the group; the other two nights we could have stayed in the overly warm snorey and farty refuge for about £15 each, but as we had a tent with us guess what we elected to do. One of the remote campsites. So day three, again dawning clear and bright we took the bus up to Pont D’Espagne, where we, the leaders, stopped and had fab coffee whilst the three groups departed on their routes, giving us sufficient time to allow a big enough gap between them and us. The next three days were a delight. The sun shone. If anything a little bit too warmly, but the cool clean mountain rivers provided a perfect foil to this, along with a plentiful supply of drinking water. The routes the groups had chosen were challenging and remote, taking us in and out of Spain; they amply rewarded us with views from the high cols and isolated camping spots that will never be forgotten. 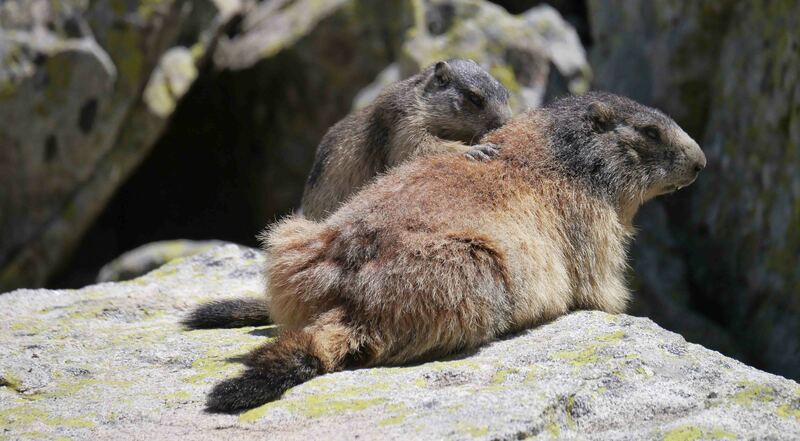 We spent a happy hour on one of the cols between France and Spain watching a family of marmots as they went about their life, completely unaware of the fact that they were country hopping on an almost hourly basis, it is of no concern to them where governments choose to draw their somewhat arbitrarily decided upon lines of power. The terrain hereabouts is challenging, sometimes contouring around steeply sided valleys on rough tracks that cross the occasional boulder field; higher up there are scree slopes where the paths disappear; there are large ascents and steep descents, nothing however that a medium fit group (which you should be for Gold anyway) cannot manage. There were a few other walkers around but the size of the landscape meant that you never felt anything other than isolated. On day three, after walking all day behind the group we were shadowing, Jane and I decided to cut and run for the last bus back to Cauterets, leaving the group at a superb wild campsite to experience their last night of splendid isolation. Motivated by the thought of a long walk if we missed said transport, we accomplished some 12km and 2000m of descent in one hour and 57 minutes and made the bus with 3 minutes to spare. Again a restaurant in Cauterets provided cold drinks and food enough to satisfy and make good our recovery. 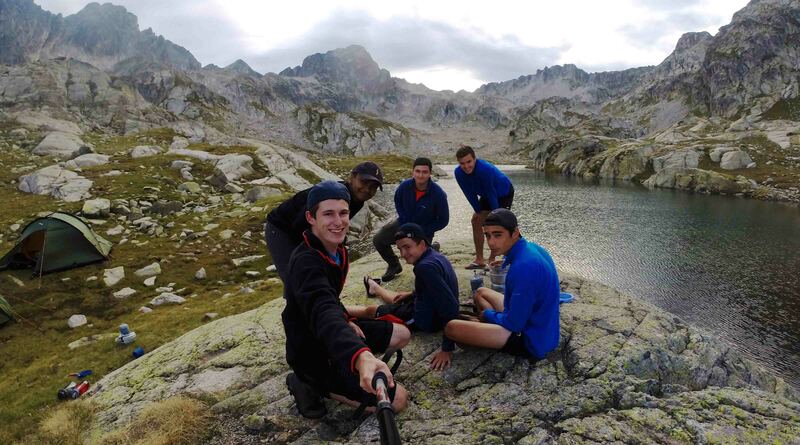 Next day the groups arrived back at the campsite in Cauterets, one by one, elated and with tales aplenty to tell. As we waited for the bus to arrive late afternoon the next day, the mountains reverberated to the deep rumble of thunder, the skies darkened, the wind freshened and big cold drops of rain started to fall just as the bus pulled into the campsite to pick us up and transport us back to the airport. 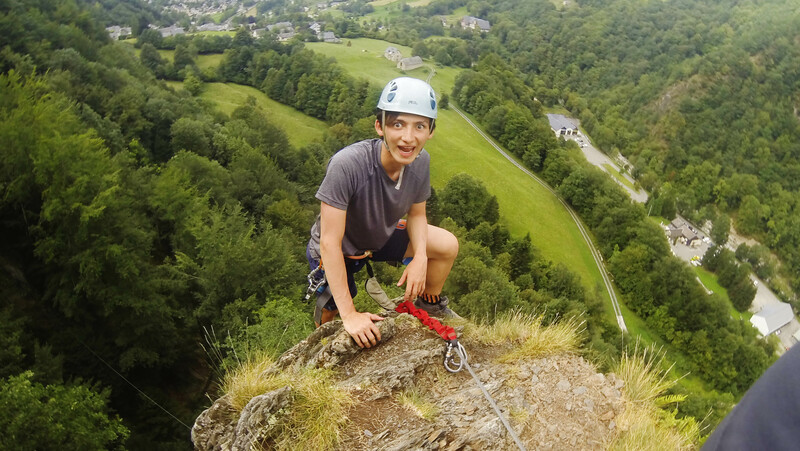 That day had been spent unwinding, packing and some of the indefatigable had undertaken the via ferrata and zip lines built into the valley some 1km from the campsite. The storm followed us up the road and delayed our flight by 24 hours, Easy jet however fed us and gave us a nice hotel in which to wait for our replacement plane, which did sweeten the pill a bit. A most excellent adventure and expedition and one that I would thoroughly recommend to those of you looking for a low price overseas destination for your Gold DofE expedition. 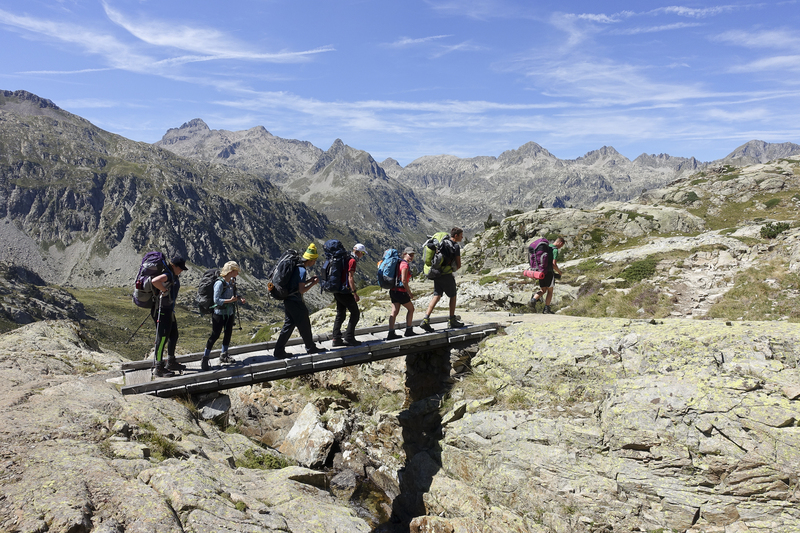 If you would like to know more about Wildcountry Consultants overseas DofE expedition locations give us a ring on 01373 455668. 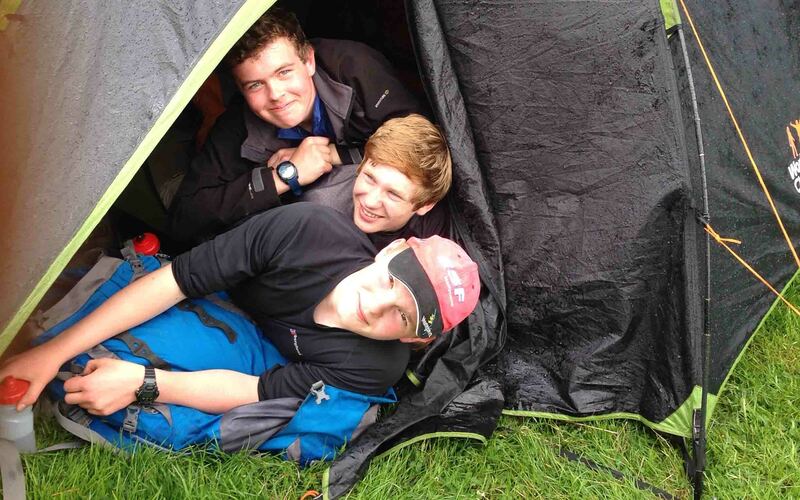 We call it silly season and not without due cause, from the last week in June to the second week in July we have facilitated over 1000 DofE days. 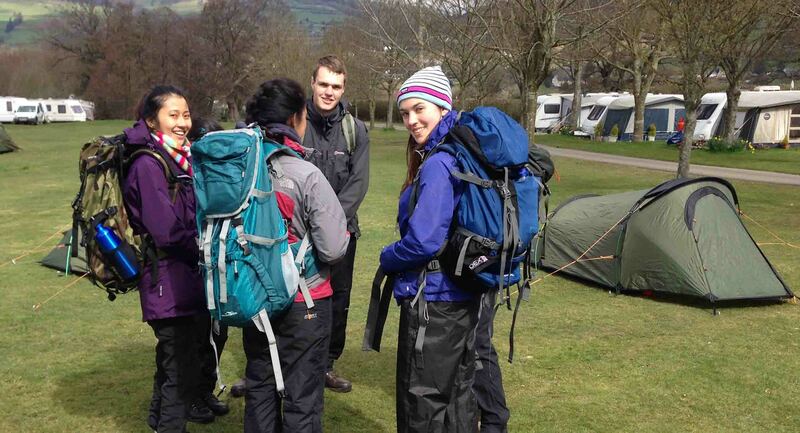 A DofE day being one participant operating in the field for one day. 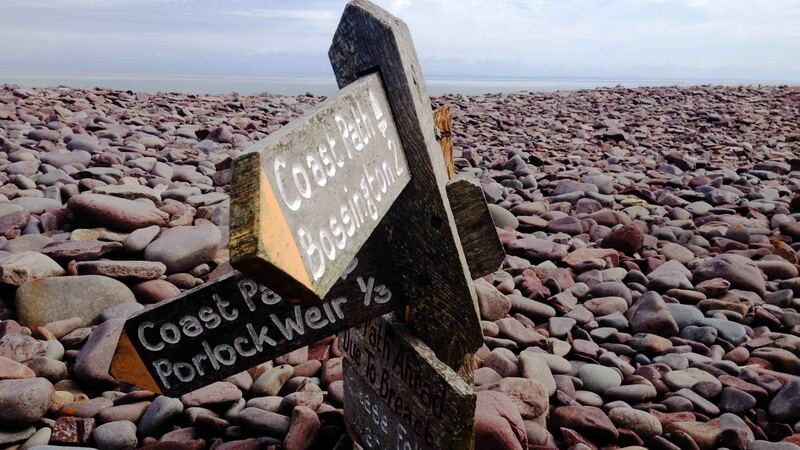 Operating across all levels of the award we have been running expeditions from Exmoor to London to the Long Mynd, the Brecons/Black Mountains and Snowdonia. We have had everything the British summer could throw at us. Groups baking on the Marlborough downs in temperatures in excess of 33 degrees to 40mph driven hail stones in the Snowdonia Molwyns. We, and the groups, have in turn been soaked, baked, battered, bitten and blasted. I would not have it any other way, to be out with these positive young people who are really driven to succeed leaves me with a wonderful feeling of achievement in having facilitated their expedition. Some of them take it in their stride, for others it is probably one of the most physically demanding undertaking they will ever take part in. There are tears, grumbles, blisters, sore muscles along the way but at the end of the two/four days there are always massive smiles brought about by the accomplishment and success. 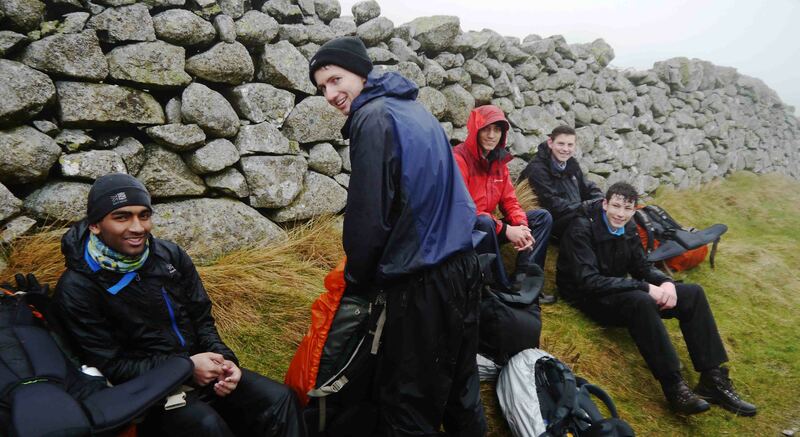 For us at WCC its not just about the outdoors and expeditioning but life lessons for the partcipants gained through operating in an environment outside of their comfort zone in a small team of friends, pupils from their own or other school or people they have never met in their lives before. They learn many hard skills like navigation, camp-craft, the need for appropriate preparation but also learn many soft skills when they have to support less able team members or encourage someone who has just about had enough. I do not think that the majority of DofE participants truly understand how much they learn about themselves, their strengths and weaknesses and the others with them until they reflect on the expedition in the months and years to come. We try to visit this aspect of their experience in the post expedition briefing but 10-20mins is never enough to pull this out. I also reflect on the experiences of the last few weeks, how I could have done things differently, which areas worked with which groups and why, how we can change things for next year. I am lifted up by the groups success and feel a real loss when they depart after the event. I also have a head full of experiences, I can still smell the sun on wet earth after a summer downpour, I can hear the susurration of the wind in the grass when I am alone, early in the morning on the high moors/mountains watching a group packing up their camp through my binoculars. I can see a Hen Harrier in my minds eye quartering the early morning moor as it hunts for its offspring lurking somewhere in a rough scraping in the grass or the delicate purple bloom of the Butterwort brightening the boggy ground in the valleys. However now we have a few weeks off, to mop up the admin of all this activity, write reports on the groups successes and maybe even have a busman’s holiday out in the summer hills. The autumn season is not that far away and we have to plan and prepare for the forthcoming events, get the cold and wet kit looked out. Silly season may have passed but there is no time for complacency. The story starts in the hard, dry and fairly barren landscape of the Greek islands, it does not however last long as Easyjet took us away, deposited Jane and I back in Gatwick and then less than 24 hrs later we found ourselves in the Cotswolds responsible ( with Choire and Neil and two or three school staff ) for seven groups of Bronze participants on their assessed expedition. I love the soft Cotswolds landscape and in late spring/early summer it is at its best. The hawthorn trees decorate the landscape like little fluffy clouds, the cow parsley lie in drifts along the roadside hedgerows and wildflowers are everywhere you care to look. This is a protected environment, not by state legislation or scientific designation but through private ownership. The Cotswolds are the heart of Old Money, not the crass new money of the Home Counties but a refined gentile ownership that seems to take stewardship of the land seriously. Rights of way are well maintained, the soft butter coloured buildings are beautifully restored and there is a peace that lies upon the land. The private wooded areas are of course a boon for wildlife and the area resonates at 0430 ( as the groups found out ) with a dawn chorus that is almost impossible to sleep through. Our seven groups had, almost unilaterally been fairly dreadful at practice, getting lost was not really an exception more of a prerequisite. We had real fears of some groups not completing and having to take the whole expedition on again. 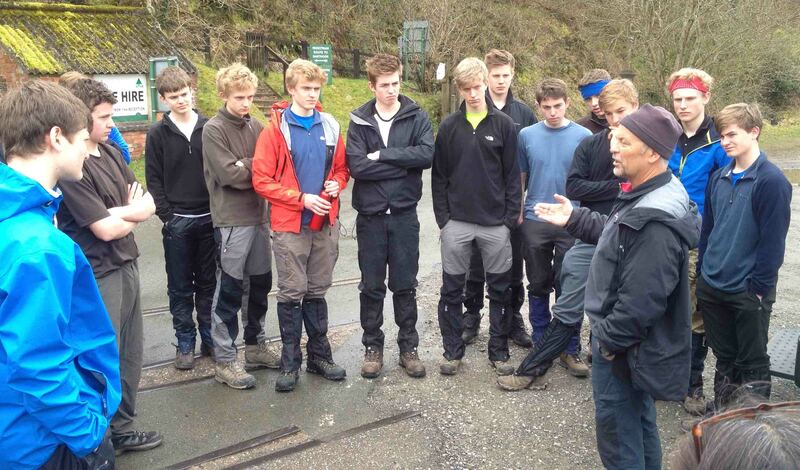 However we were to be surprised, all the groups turned up well prepared and ready for the expedition. They then proceeded to navigate through the countryside with hardly any mistakes. Arriving in camp they quickly set up shop, cooked, cleaned up and retired after a little bit of calm discussion between groups on the days experience. One of the groups make their way along the ridge line. 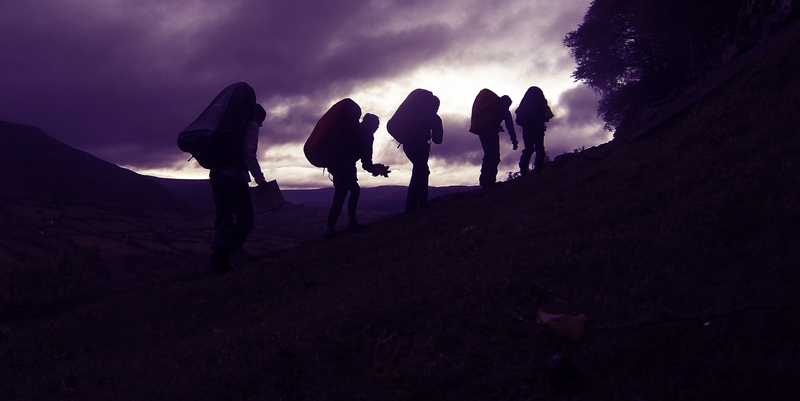 What a ( most welcome ) paradigm shift, then, with no delay it was off to the somewhat harder Black Mountains of the Brecon Beacons to put three gold groups through their paces on the training and practice expedition. Again however we were to be pleasantly surprised, these guys were well turned out and already had a good understanding of the requirements for a Gold expedition. Again the weather was just sublime, maybe a little hot on day one, a bit of low cloud on day two but otherwise ideal for walking and camping in the hills. Sometimes our job can be really tough, rubbish weather, poorly prepared groups who require a lot of support and training however at other times it can be really really great and this was one of them. I just hope that these guys do not assume the assessed will be the same. So Hard soft hard, no not really just really enjoyable. 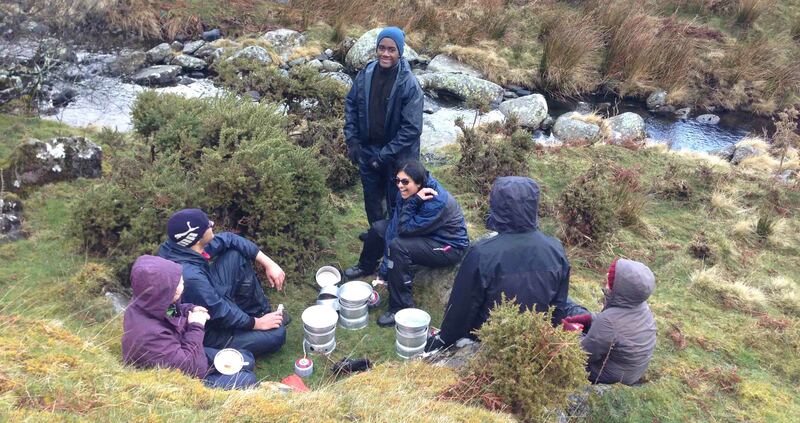 Two teams from St Mary Redcliffe and Temple school came over to the Black Mountains to enjoy some lovely weather over the Easter weekend and to undertake some outdoor skills training in prep for their Gold practice expedition later on in the year. Group 1 suited and booted ready to leave for some Nav training. What a difference a week makes, sunshine, light winds, almost 20 degrees. Does this means summer is here, hmmmmmmmm. A baptism of Fire for the start of the 2015 season 26th March – 1st April 2015. The daffodils in Snowdonia nodded in approval at the lambs in the fields who were testing their ability to leap straight up into the air and land in the same place they had taken off from. This was incredibly unlikely given their body weight and the 40mph wind that was blowing. More often than not they were bowled along the ground or blown into their fellows who then tried to prove that they could do it properly with equally hilarious results. It was spring was in Snowdonia and Jane, Phil and Dave were with five groups from St Olaves school in Orpington who were pitting their skills against their assessors keen eyes, I was not really taking part due to my continuing inability to cope with steep ground but along for the ride nonetheless. The season had started with a megabang for us this year with 5 expeditions running simultaneously from the New Forest, Brecons, Dartmoor and Snowdonia. I doubt they could have picked a worse week to do it. I focus here on the Snowdonia expedition as this is where I was but I know for sure that none of the others had an easy time of it except maybe Choire who saw blue skies and light winds for the silvers he was training with Brett and Levi in the New Forest. Our trip started well enough with an overcast but dry day in Penmenmawr allowing us to pitch tents and check kit before the expedition started for real the next day. Almost immediately we left the campsite the next morning the rain started, climbing up into the Carneddi it turned to sleet and then hail being driven by a fierce wind. This made forward momentum difficult, not only due to the affect of the wind but not being able to look to where we were going due to the sleet. By lunchtime everyone was soaked to the skin and frozen, we found a really nice spot to cam which provided shelter for the night, ate and slept in lovely warm sleeping bags. The next day the forecast was for a rapid deterioration, this kept us low again but two of the groups excelled by making Dolwydellan before the storm came in, and came in it did, 97mph winds were recorded in Capel Curig which is where two of the groups were camped. We survived with just one broken tent pole. Effective pitching in a strategically chosen campsite coming to our rescue. Next day it was over the Molwyns to camp in Llyn Gwynant valley and then foregoing our usual ascent of Snowdon for our last day due to wind and snow we elected to finish on a high at Pen y pass. A sheltered spot for cooking. I had forgotten the delights of washing up pots in a freezing stream. Frustratingly we did not do the routes we had planned but we managed to accomplish a four day journey thorough the Snowdonia national park in weather that set records for the area. I know the others from Monkton Combe, Collingswood and Kings Gloucester had equally abhorrent weather and I know they all managed superbly. I also know our instructors pulled out all the stops to make their expeditions happen safely. What a start to the season, things can only get better, but a whole lot less exciting.